Here we like to highlight our involvement in our local communities. We feel that at the nucleus of every community there is a hugh support system. We intend to share positive updates for locally owned and operated businesses with you through this category. Plan your trip to the ‘quieter side of the Smokies’ this spring with help from our newest magazine! In this issue you’ll have a crazy amount information to help you with your next vacation OR ‘stay-cation’, here in western North Carolina. From Smokemont Campground in Great Smoky Mountains National Park (yes, there is STILL much to enjoy on the NC side, regardless of the U.S. 441 landslide), to the Appalachian Trail Community, Franklin NC’s ‘April Fools Trail Days Festival‘, March 29th & 30th, 2013, you’ll be sure to find something to get outside and enjoy this spring! Next up… be on the lookout for our May/June issue! As always, you can find our on-line magazine on ALL of our website pages. Rosebud Cottage on Main Street in downtown Franklin NC is a popular gift shop for home decor and accessories. Owned by local resident, Martha Holbrook, this unique shop also offers a deluxe sandwich shop, complete with gourmet offerings, ice cream, sodas and homemade sweets of all kinds. Martha & Rosebud Cottage have played an important role in the business community of downtown Franklin over the years by being involved in the Franklin community and by expanding their business to a much larger location on Main Street. And now, Rosebud is expanding again. Today, they announced that dinner will be offered two nights a week (Thursdays & Fridays) from 5p – 9p, starting November 15, 2012. Exciting news for downtown Franklin!! We/I highly recommend Rosebud Cottage for lunch, and we’re so excited to see what kind of delicious items they (Chef Lindsay) will be offering on their dinner menu! Or, find them on Facebook! Breweries in Western North Carolina seem to keep popping up. With 19 breweries & pub breweries in North Carolina’s western region, WNC is becoming quite the destination for beer connoisseurs of all kinds. If you’re interested in finding more info on area breweries, check out ‘NC Brewers Guild‘. With the majority of breweries & pub breweries in Western North Carolina found in Asheville, NC (a total of 9), the city of approximately 80k has been dubbed by many, ‘Beer City USA‘. Internet voters weren’t the only ones willing to make Asheville, Beer City USA. Just this year, two HUGE announcements from micro brew giants, Sierra Nevada & New Belgium breweries, were made to locate their East coast distribution centers in the Asheville area. This major news may have solidified the title for years to come. Although Asheville has it going on, the local beer scene West of Asheville is showing some promise as of late. Be sure to check them out when in the area! So, now that you know about local brew in WNC, who will open the very first brewery in Franklin NC, Highlands NC or Cashiers NC?? Cash Mob. Have you heard of this? Well, we have and we’re pretty excited about the concept spreading to our small local communities in the Western North Carolina area. If you’re unaware of this phenomenon happening throughout the country and beyond, we feel you will soon! The concept. Imagine a small locally owned business in your hometown or community you currently live in. Think of your favorite business or one you are intrigued by but haven’t taken the time to stop into yet. Now, get a group of friends from your area together (like-minded folks help) that you are in touch with via Social Media often. After you’ve talked with your friends about the idea, convince them to open their wallets or purses and pull out a $20 bill and committing to spending it at your business of choice. Finally, coordinate a date and time with the local business to do the cash mob (so they are aware and can prepare). There are many variations of Cash Mobs going on all over the country. Each town or community will have a different situation, but this concept is simple enough to work anywhere!!! Locally to our area of NC, Venture Local Franklin has been talking about doing one and we’re anxious to see what they do with Franklin’s first Cash Mob!!!! Dillsboro, NC’s mobile app ‘Launch Party’ helps introduce David Belcher as Western North Carolina University’s new Chancellor. Pulling into Dillsboro, NC this Monday afternoon (I was driving in from Franklin, NC) I couldn’t help but become overwhelmed by the welcoming shade of PURPLE! Wow. The students and faculty of WCU have really outdone themselves with the decor throughout the towns of Dillsboro & Sylva. What a fantastic partnership between University and Community that has, what looks to be, rejuvenated ‘purple pride’ in Jackson County. Both towns (Dillsboro & Sylva – I went on into Sylva after driving through Dillsboro) are completely decorated in purple from street corner to store front, including the Jarret House and the Jackson County Chamber of Commerce. Impressive to say the least. I must say… well done. After chatting with local owner John Bubacz and grabbing a tasty cup of joe at his ‘Signature Brew Coffee Co.’ in downtown Sylva, 5pm was approaching rapidly so back to Dillsboro I go. I met my friend and colleague Emily Breedlove at the entrance to the Jarret House and in we went. We were immediately met with smiling faces and ‘hello, how are you’ greetings from students at WCU. A great start. Moving down the hall towards the back of the restaurant portion of the Jarret House, Emily and I enter the back dining room where the presentation for the mobile app was set up. I turn and say to her, ‘looks like we’re in the right place’. As I said that, I see a sharped dressed fellow walking towards us with a smile on his face. He looks at us and says ‘I sure hope this is the right place, or I’m in trouble!’ Of course, it was the man-of-the-week himself, Chancellor David Belcher. Emily and I continued on with introductions and began to network a little bit by sharing what we do with the Chancellor. As we were chatting, I couldn’t help but notice what a pleasant guy David Belcher was. 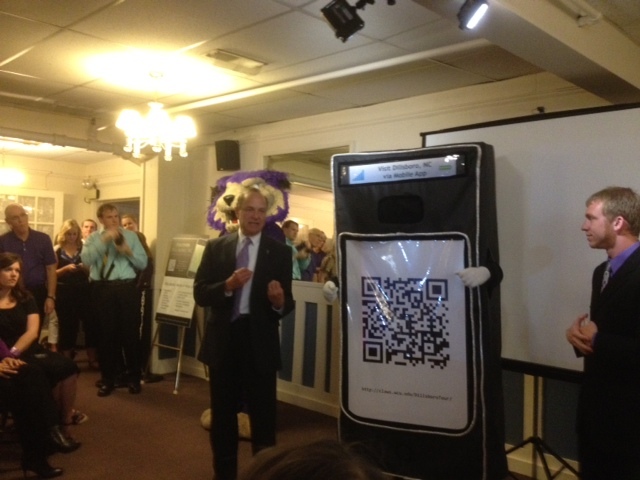 Next, was the unveiling of the mobile app! After a brief presentation by the development team, the Chancellor and his wife were the first two folks to download the mobile app via QR code. 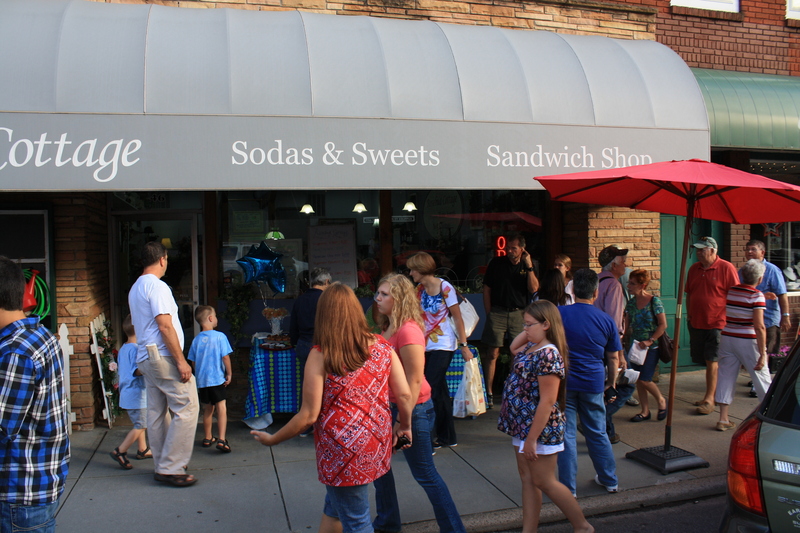 Directly following the presentation, the large group that had gathered around were invited to hang around and enjoy some yummy refreshments, supplied by the town of Dillsboro Merchants Association. It was a great ‘Launch Party’ indeed! And I would like offer my congratulations to David Belcher, Western Carolina University and to the town of Dillsboro, NC! You have a beautiful partnership in the works, and I’m excited to see where it takes you both! Matthew Bateman, local expert with Stay And Play In The Smokies, recently presented Bill Van Horn, volunteer representative with the Appalachian Trail Conservancy, a check in the amount of $327. 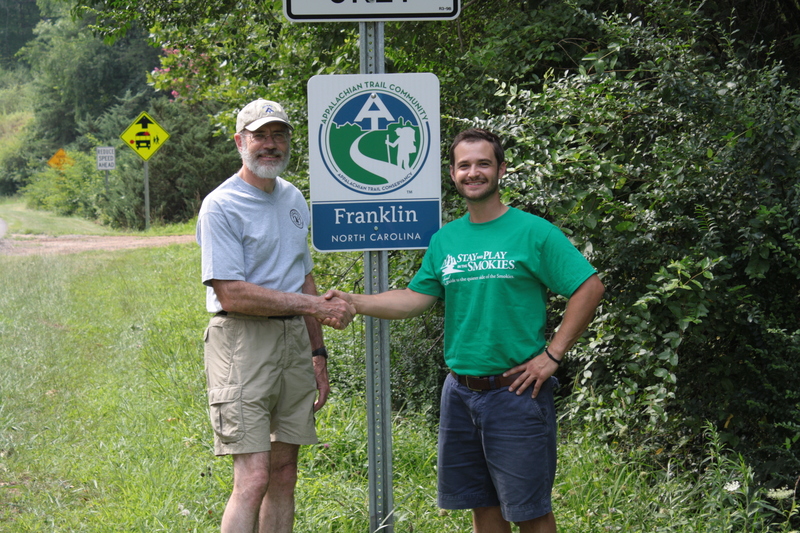 The donation was generated via social media platform, Facebook, and was designed to highlight and raise awareness of the Appalachian National Scenic Trail (A.T.), as well as Franklin’s new designation as an official A.T. Gateway Community. Franklin is now one of only fourteen cities designated as A.T. Communities at this time. Bill Van Horn, is a member of the Nantahala Hiking Club, the local Appalachian Trail maintaining club. The funds will be used by the Appalachian Trail Conservancy and the thirty-one clubs who also help to maintain the Trail. Bateman wished to express his opinion that western North Carolina (particularly Jackson, Macon & Swain Cos.) is “an outdoor lover’s dream.” He also feels having the designation can be of positive benefit to both those who utilize the Trail and local area businesses. Stay And Play In The Smokies was able to garner many supporters through their website and proficient utilization of social media as a unique way to interact with visitors planning a trip to see the ‘quieter side of the Smokies’ and local residents.